the biggest fish are caught in the winter. regulations you need according to the county you are planning on fishing in. understand the rules for your choice of destinations. 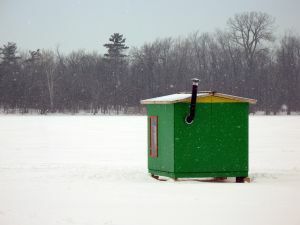 For the most part, ice fishing season is open from January 1 to March 31.
shelter, there are regulations about that, too. If you've never been ice fishing in Maine, you may want to start out with a guide. waiting for the fish. This can be done with or without a shelter. The second way is to utilize holes dug by other fishermen the day or two before. moving on to another hole if they don't catch anything. different limits, both for number of fish and weight. may find amusing; if not to participate in, at least to watch. tournament and a snowshoe race. and articles at: Great Ice Fishing House Plans.